One of our many stops at First Friday was the new gallery, Hippie Nation at the Fremont Street Experience In Downtown Las Vegas. I had met John at the unveiling of the Hippie Buses that are the stage for the Hippie Bus Show. 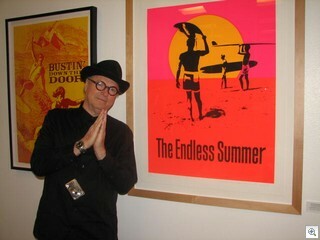 John Van Hamersveld let me take his picture with his favorite of the many famous works that are on display – “The Endless Summer” poster. The gallery is a great addition to the Fremont Street Experience. These are all signed prints, and available for sale at pretty reasonable prices considering the fame of the artist. John and his wife will be in Las Vegas all summer. My understanding is that the gallery will be open in the evenings. 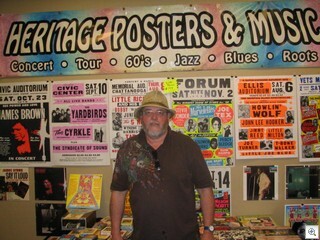 Heritage Posters and Music is behind the Hippie Nation Gallery in the same space on Fremont Street. There’s a terrific assortment of original concert posters, albums, photographs and other memorabilia. Together with the gallery, there’s plenty to stimulate the senses. There’s also a full show of the images of the hippie era that John has created exclusively for the VivaVision. The schedule for his show can be found on the Fremont Street Experience’s “Summer Of ‘69: Vegas or Bust”. It rotates with Rock Anthem series which plays all summer. Some of the other “watch it again and again” shows on the VivaVision are “A Tribute To Queen”, “George Thoroughgood – Bad To The Bone”, “Kiss Over America”, and “Don McLean’s American Pie”. And don’t forget the FREE concerts. Next up is July 3rd and 4th for Big Brother and The Holding Company as well as The Grass Roots.